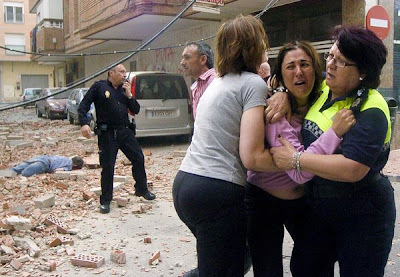 Amid the rubble of two earthquakes in Spain Wednesday, a police officer (right) tries to console the daughter (center) of one of at least ten people killed during the natural disaster. Striking near the southeastern town of Lorca (map), the Spain earthquakes injured dozens, damaged historic buildings, and fractured highways, according to officials cited by the Associated Press. The second, more powerful earthquake was a magnitude 5.3 temblor that struck at 6:47 p.m. local time, U.S. National Earthquake Information Center seismologist John Bellini told the AP. It came roughly two hours after a magnitude 4.5 quake rocked the town of 91,000. Both earthquakes originated from the same approximately six-mile-deep (ten-kilometer-deep) spot outside Lorca. Situated near the boundary of the African and Eurasian tectonic plates, the Lorca area is no stranger to earthquakes, though most are too faint to detect without seismological tools, according to the U.S. Geological Survey. 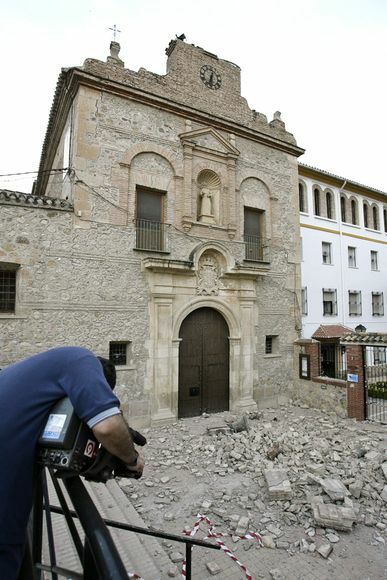 A fallen bell tower lies at the foot of a church in Lorca after two earthquakes rocked the town in southeastern Spain Wednesday. School children frequent the church square in the early evening, and if the second earthquake had struck ten minutes later, the collapsed tower could have caused a "tragedy," according to a Spanish TV broadcaster who was on the scene, cited by the Associated Press. 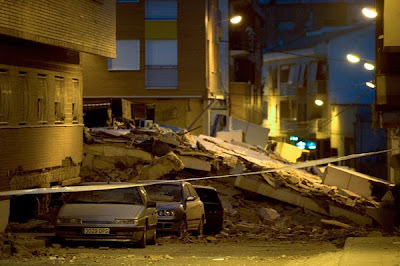 A blanket-covered body lies in the San Diego district of Lorca, Spain, after Wednesday's earthquakes. 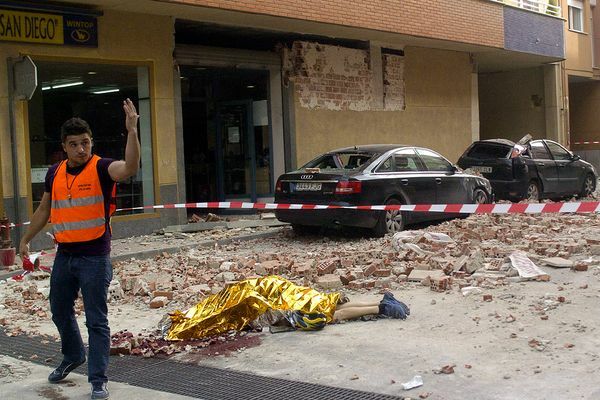 Throughout the town, falling bricks and other building parts injured dozens, and at least ten people have been killed. Cars sit crushed beneath a flattened building in Lorca, Spain, after Wednesday's earthquakes. Elsewhere in the city, a collapsed car tunnel trapped drivers, while cracks shot through roads and overpasses, according to the Spanish daily El Pais, cited by MSNBC. Lorca residents seek the security of the open air outside the town after two earthquakes sent buildings crumbling late Wednesday. "The population is scared and are very afraid to return to their homes," a regional official told national radio, according to MSNBC. "There are thousands of very disorientated people." (Read about the science of earthquake prediction in National Geographic magazine).